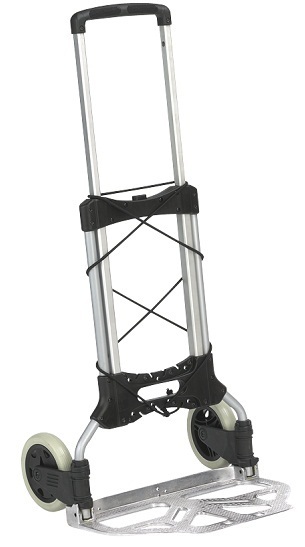 Wesco Mini Mover Folding Hand Truck-$104 Free Shipping! The Mini Mover If you’ve ever had the desire to own a hand truck that can fold up to fit inside an overhead airline compartment, then look no further. 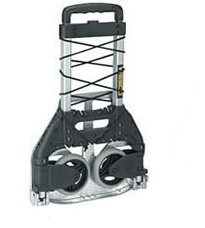 The 7lb aluminum Mini Mover folding hand truck can carry 110lbs of luggage of any type, and then fold up to fit into incredibly small spaces. Do you have luggage without wheels? Well, don’t get rid of it; pile it on your Mini Mover and move it through a busy airport all the way to the ticket counter and then stow it away in one of the very bags it just carried! Use it to move boxes of files, books—or even someone else, if you are so inclined. It has the same sturdy wheels you’ll find on any of our lightweight folding hand trucks, and will handle any terrain without tipping over. Don’t break your back carrying things you can pull along! 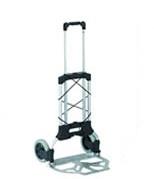 Check out this other Superlite foldable hand truck. See what other small hand trucks we offer. Extended demensions 41" x 15.5" x 17.5"
Folded Demensions 24" x 15.25" x 2"
Wheel sixe 5" x 1.25"
Cargo Weight capacity 110 lbs. I love the cart. I use it for my 45 lb. music amp as well as for groceries, etc. It folds up easily and fits in a corner of my car trunk. It is well built and sturdy.